There are some things you cannot fully grasp unless you live through them. Sundays in the Pacific is one of them. It does not matter if you are in Tonga, Samoa or the Cook Islands, Sundays are sacred, in the purest meaning of the word. You may try to go against tradition and find things to do to keep yourself occupied but the reality is that there is absolutely nothing you can or should do on a Sunday, it is a day of rest, of food and of singing! In some countries, like in Tonga, it is not only discouraged to engage in physical activity but it is also illegal and so in relatively touristy places, those who do not oblige may even be fined. From pretty much midnight on a Saturday until the end of the day Sunday nothing is open, nobody works and no activities are organized, perfect for a day catching up on sleep, reading or, in my case, writing. But then again, Sundays are not meant for these activities either. There is one, and only one thing, that can and should be done on a Sunday: go to Church. You can show up independently and join any congregation but, if you get invited by a local, all the better. In Samoa, on the day after my birthday, a local lady who was serving me breakfast at the hotel invited me to join her church. Although the service is usually open to anyone and locals are welcoming to foreigners an invitation means having a personal tour guide/translator as the service is usually in the local language and, if you are lucky, a traditional umu lunch following the service something which is great on its own. I am not a religious person yet I found a visit to Church in the Pacific to be extremely fascinating and enlightening. It is not because of the Bible readings or the Pastor’s sermon, both of which, pardon my cynicism here, tend to be pretty standard everywhere, but the most spiritual and beautiful part of the service is the singing. 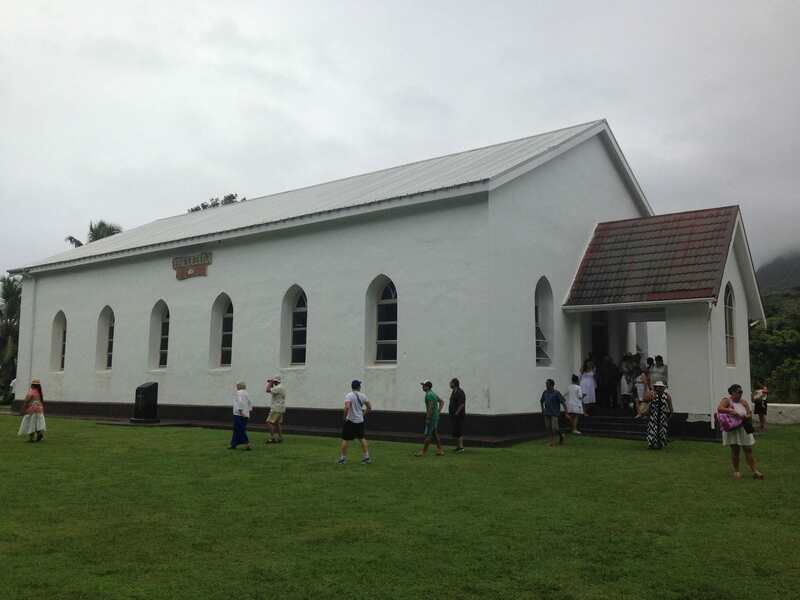 When, on a Sunday morning, I woke up in Rarotonga, in the Cook Islands, on the aftermath of a strong cyclone and with the threat of rain and chill still lurking, I decided it would be a great idea to go to Church. I know, this sounds slightly weird from someone who stopped going as soon as she had the chance, but the previous experience in Samoa proved a very good one and I found this a great way to take a peek into the local culture. Firstly, people dress up in their best and brightest white outfits. In Samoa they used to wear traditional attire which meant layering a weaved grass skirt and thick belt over white dresses or pants for the men. Women would wear wide brim hats, also in white or beige. These bright white outfits would contrast with the stark green surroundings of a tropical island. Everybody’s clothes were immaculately clean. In the Cook Islands I found the entire outfit to be less formal although people still dressed up in their best clothes ready to take on the world. Rito hats in the Cook Islands take center stage, as do white clothes, but nods to traditional items were less pervasive making only an appearance on the ornate flower head dresses or eis worn over hats which stayed on for the duration of the service. The head dresses are extremely beautiful and although a lot of people may wear plastic fake ones the real freshly weaved ones are absolutely stunning and a work of patience and skill. Cook Islands Christian Church is the largest with 18,000 followers half of which reside in the islands and the rest in Australia and New Zealand. I attended service at the largest of them, used to welcoming foreigners and very hospitable. The Reverend warmly eluded to us a couple of times making me feel extra welcomed. At one point towards the end one of the songs was dedicated to us and we were invited to stand up and sing the beginning of it. Not to worry, we had the lyrics projected on the wall behind the Reverend and could perfectly follow, karaoke-style. Living in Asia, the karaoke part was slightly odd. The lyrics were projected throughout the service but most of the songs were in local language so harder to follow. The service lasted for about 75 minutes of which around two thirds were passed singing. The choruses and lyrics are split into two groups. Men and women have separate lines sometimes overlapping. This is not gospel singing, these are Pacific rhythms with a Christian undertone. At the beginning the singing is more tamed and toned down but as the service progresses, the attendees seem to warm up and the singing increases in volume, speed and intensity. There was no clapping or the entranced images you may have from gospel singing that appear in the movies, people here sang to themselves and to God. The Reverend did translate a few parts of the sermon, the most relevant ones I would assume, into English but it did not matter to me, I was completely absorbed in the singing and cultural aspect and the time simply went by extremely fast as I lost myself into the sounds. I watched people sing and occasionally drifted away staring at the children on their tablets. The first rows were occupied almost exclusively by children, little ones, who were clearly uninterested in the service and most likely unable to comprehend but who had thankfully been given tablets. Those who didn’t wandered around the church, danced when the music got louder or simply played with each other. There was a surprising amount of children. Towards the end I turned around and realized that the church was full. Most people trickled in during the first 15 minutes of service. Nobody seemed too bothered about those arriving late or about the frequent running or screaming of children, the entire service felt like being among friends, relaxed, uncomplicated and opened to everyone. I found myself oblivious to the surroundings and completely absorbed in meditation. I could not understand most of what was being said but it was magical in relaxing and taking me away into a world of mental clearing and disconnection. After the service ended we were invited to refreshments at the back of the church. This was complimentary to everyone and visitors were particularly welcomed. I got to hear a bit more about the history of the church and the service and interact with the Islanders which added a personal touch to the experience and made it all the more authentic. And of course, there was free flow of food – what they call snacks is actually a full meal to me. If you ever visit Rarotonga, this is a must on a Sunday. Forget about religion, the singing and the harmony of the voices will transform you and make you feel at ease with the world, as if restoring the balance of humanity.